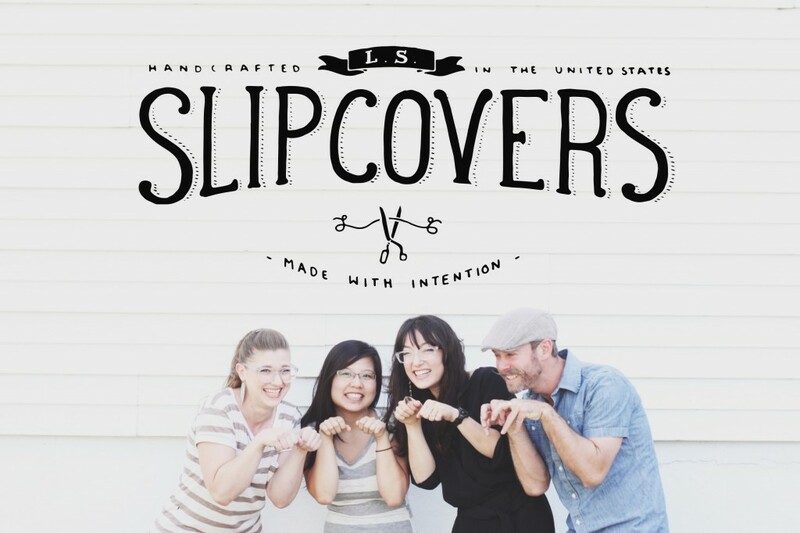 If you follow me on Instagram or have been reading my blog long you know I love slipcovers and over the past year I have been collaborating with a new slipcover artist and team! All of the seamstresses I use are great and Michelle Fritz my friend that has MAKE slipcovers iss so talented too but she is out from Houston and not always looking for crazy deadlines and volume. When my client Stacy told me about Laura and her team I knew she would be able to help me with some clients and she has proved an amazing talent. Today I want to show some of their most recent work and a fun recent colloboration for one of my favorite clients. First off, these amazing chairs! This popcorn detail (its actually a zillion perfect little french knots but I like to call it popcorn) and the length of the skirts just make my heart flutter…of course the amazing photography of Becki Griffin highlights the work of LS so well…Pretty shots Becki! Perfection huh? I don’t even usually like pink (sin i know) and I want these chairs! Laura has her own linen fabrics in stock in white and flax and various weights so you don’t even have to worry about finding the perfect linen for your project. She has already done the work and keeps in stock and washed so it doesn’t shrink after the slipcovers are made . . . I love this flax color but I also love white of course! 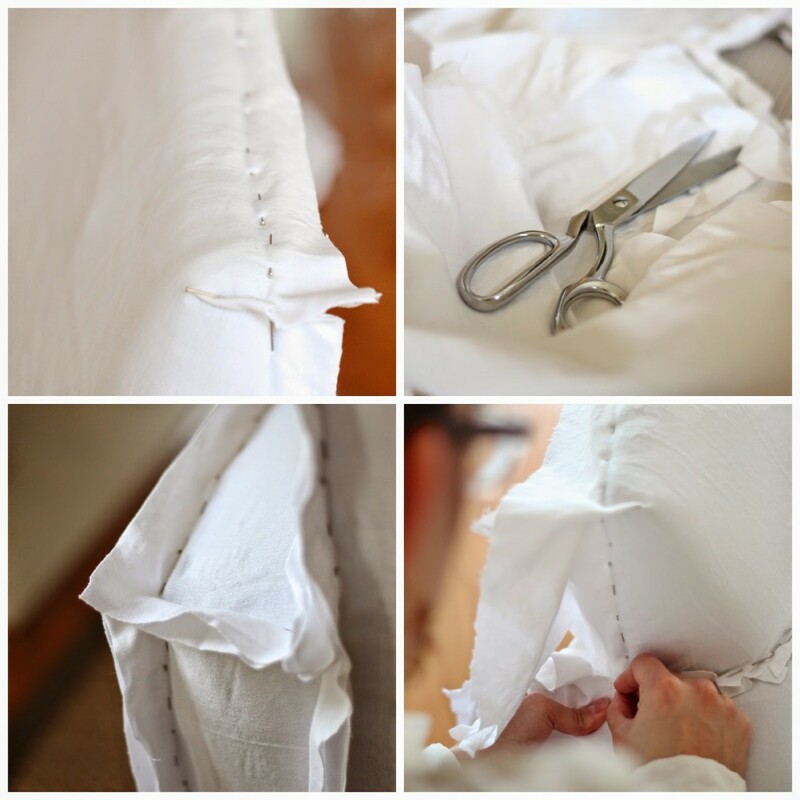 So much work goes into a slipcover. And it happens in your home for the most part, Laura comes to you! Her team helps her with the rest of the sewing and other part of running a business like bookeeping etc. But she does the design for the most part and pin fitting and cutting. Truly handcrafted in America! As you can see, LS Slipcovers has also mastered the ballerina tie as well. Laura K was the lead designer on this project and did a great job! 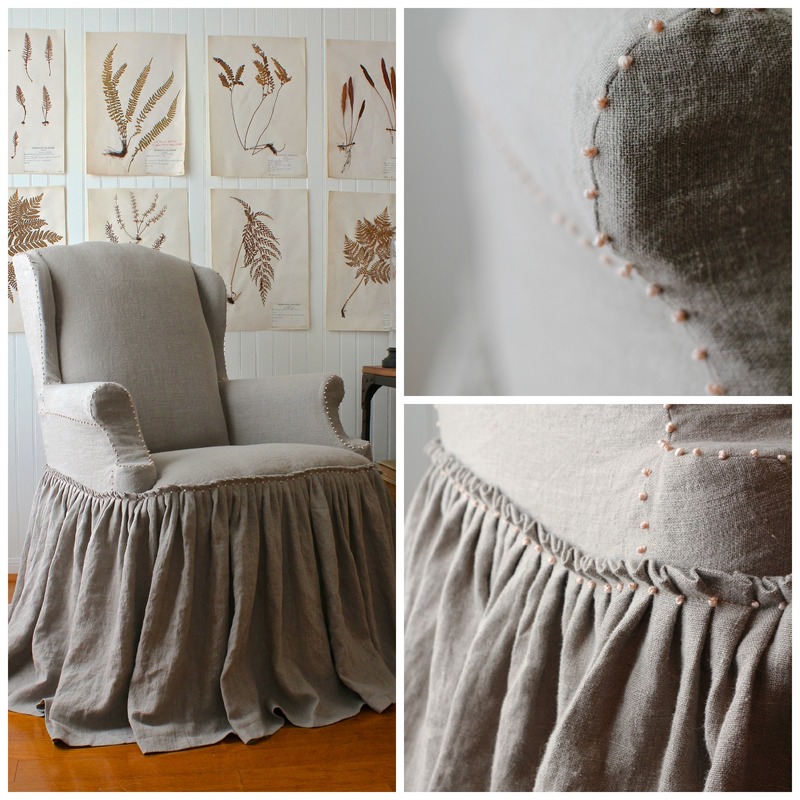 Love this chair skirt. They can do this on piano stools and barstools. The possibilities are endless. She is really creative and can help you sketch and determine what is the best treatment of the furniture you want to slip. 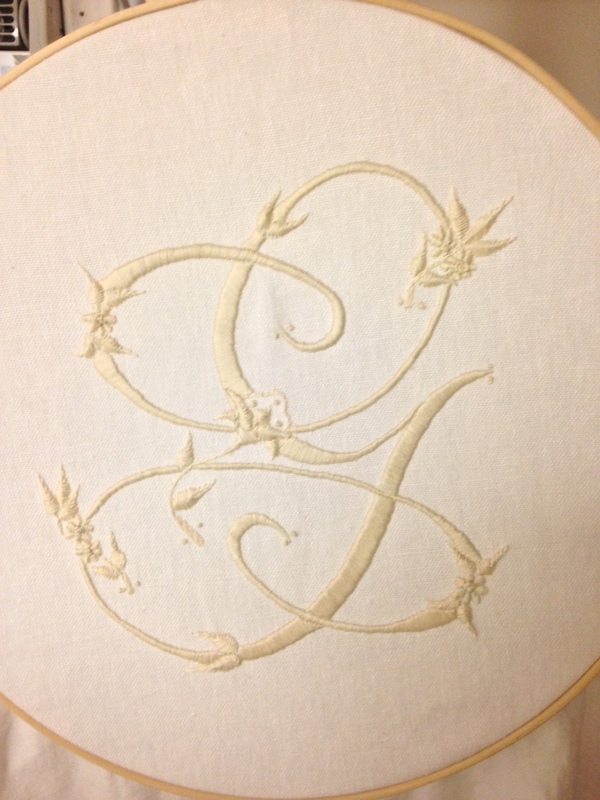 She can even design a custom monogram and hand monogram your fabric! Laura and I recently colloborated on a special monogram and treatment for my client Rachel Guidry in Louisiana. You can see more of the Guidry home here in my portfolio. 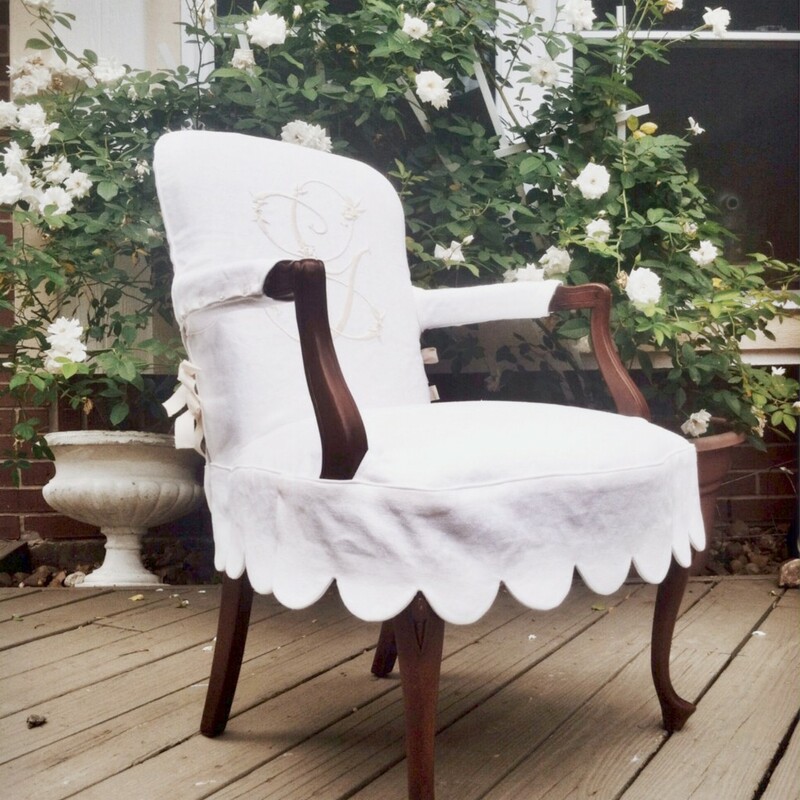 This chair is for a guest room and we wanted it to be special so we decided on a scalloped skirt, ties and tone and ton monogram. 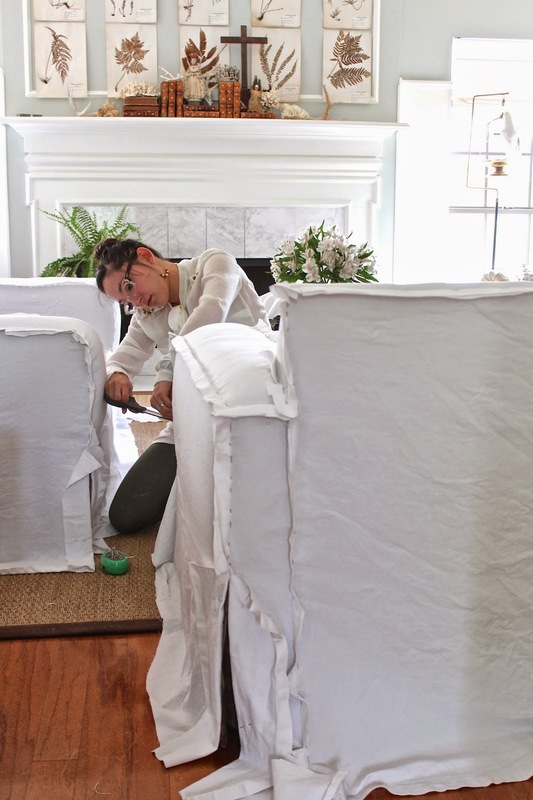 I always feel like I am writing wedding gown descriptions when I am blogging or describing to clients how and what Laura can do with slipcovers and monograms. It’s because the details truly are dressmaker, special and frankly couture. Look at this monogram! And Rachel is so happy as you can tell (isn’t her baby bump the sweetest so happy for their family). So here is the deal if you want to work with Laura and her team and you live in Houston you are lucky, her prices are reasonable considering the craftsmanship and work is amazing and turnaround is good. Click here to read about her prices and fabric requirements so you can get a quick idea of the investment. If you live further away like Rachel, or even states away, you can still work with Laura with a little planning and flexibility. Email her to discuss ways to make travel work and see about the travel cost. If you really want a custom look and you have found furniture you want to repurpose the price to have her travel may be more feasible that you think. And if not you still enjoy her work with her Ready To Wear line for IKEA, Pottery Barn and Restoration Hardware chairs. 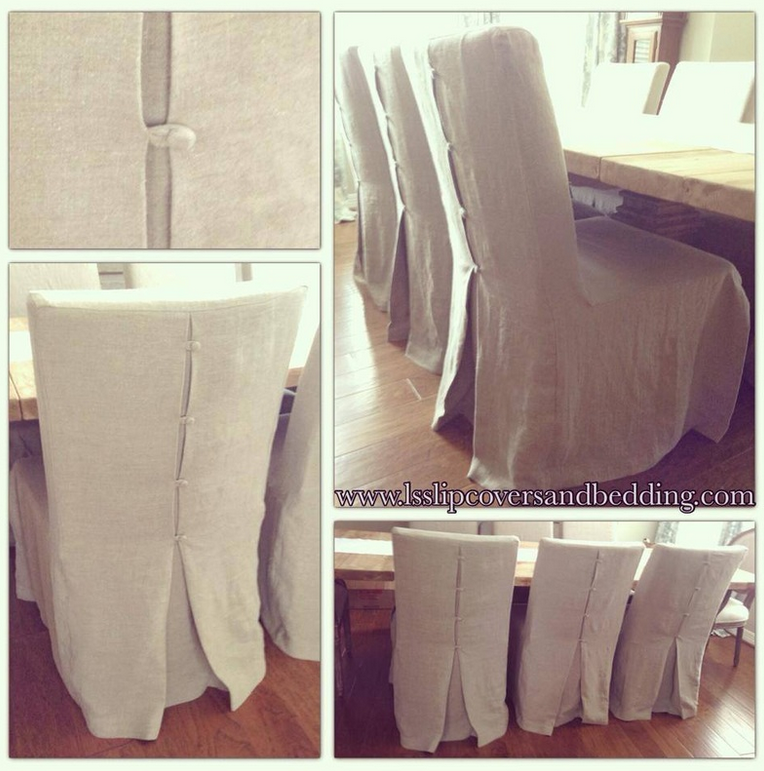 She did these linen slips for my client Beth and they look amazing…those are IKEA Hendriksal chairs y’all and they never looked better! So there ya go, explore her site if you love this look. And you can also email them photos of your furniture for more specific pricing. I get so many questions about Laura and her work and I wanted to share more with you of our recent designs and her process and where she will travel. I have even more to show you and hope to soon! It’s such a joy to work with people who are creative and LOVE WHAT THEY DO! Blessings on you Nathan and Laura and your beautiful sons (and Laura K and Jeanie too!) I love what you do and love your American “maker” spirit! 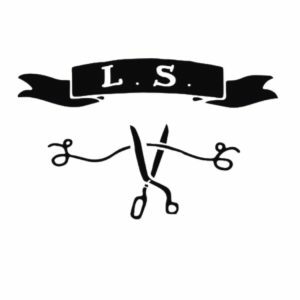 Also be sure and follow them on Instagram and facebook..rumor has is LS is doing a fun giveaway soon from the READY TO WEAR line! Slipcover Heaven is right! The details are gorgeous!! And I am happy to know that I am not the only female on the planet that does not care for pink. 🙂 Hallelujah! Those slipcovers are beautiful. Was the monogram done by LS, also? If not, where or who did the monogram? Gah, I am in love! Such beautiful work by an amazingly talented team. Dreamy . . . I don’t know how else to describe them. Each one looks likes a piece of art. they’re coming over my house! can’t wait!!! 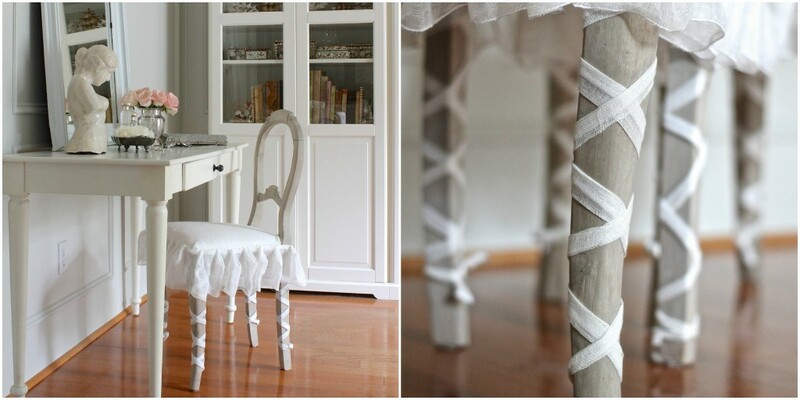 Looks like such an easy way to to accent any chair and fit any style! The chairs look very nice! 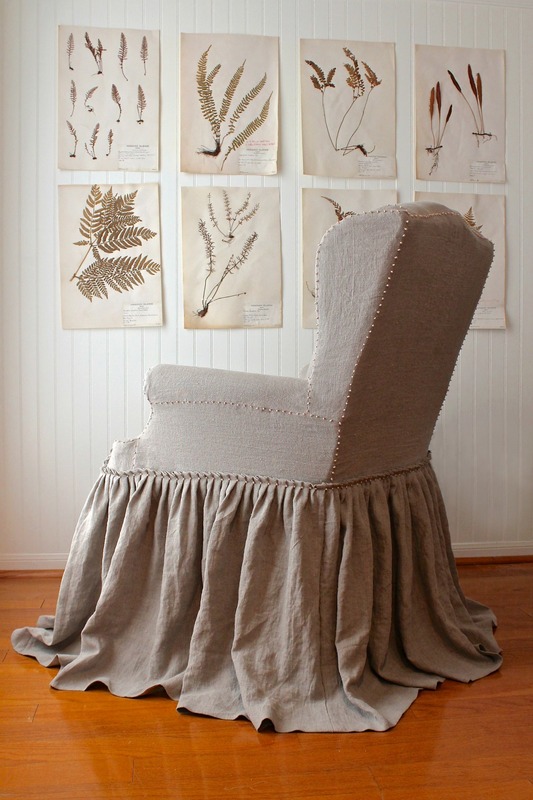 How do you get your monogrammed scalloped slipcover on? Working on a similar project in Indiana (or I’d just call Laura!). This looks seamless.